Because a sensor using the surface acoustic wave (SAW) are nondestructive, compact and light weight and has other features, including high practicality, a wide variety of products are being developed and put to use. While researching methods using SAW to detect surface flaws in balls for ball bearings, Kazushi Yamanaka discovered that the phenomenon of diffusion resulting from diffraction of surface acoustic waves, which was the greatest drawback to planar SAW sensors, could be masterfully eliminated by using a sphere. With a sphere, in other words, the surface waves generated from one point focus on one point, no matter what direction they are propagated in. From this fact, he discovered that under certain conditions, waves form a parallel (collimated) beam propagating around the equator and make over 100 turns (roundtrips). This phenomenon will make it possible to develop sensors that are compact and of extremely high sensitivity compared with the conventional planar SAW sensors. In reality, from the results of simulated calculations, it was understood that with the spherical SAW, if the collimation condition is satisfied of the aperture width being close to the square root (geometric mean) of the product of the wavelength and the sphere's diameter, this phenomenon will occur universally, no matter what the type of wave. As a SAW generated under such conditions is not subjected to scattering from the sphere's support, it makes ultramultiple roundtrips, making sensitive detection of changes in the speed of sound or the attenuation effect possible by means of the gas molecules adsorbed on the propagation route. Using this principle, the candidate developed a ball SAW sensor that made it possible to detect gas with extremely high sensitivity. Kazushi Yamanaka et al. applied the measurement technology they discovered to hydrogen gas detection and succeeded in detecting hydrogen gas with a single sensor in what constitutes a 5-digit range: 0.001% to 100%. It is already undergoing a manufacturer's field testing as the first high-sensitivity hydrogen gas sensor that can be safely used even in environments containing high- pressure hydrogen cylinders. Environmental and social safety and security gained top priority in recent years, and state-of-the- art sensors for dangerous and hazardous gas are strongly required for this purpose. Additionally, where high-pressure hydrogen is used such as in hydrogen stations and fuel cell powered vehicles, sensors are required that can measure hydrogen from low to high concentrations; in other words, a 5-digit concentration range of 0.001% to 100%, in order to handle both microscopic leakage and high-concentration extrusion. However, because current chemical sensors using the catalysts and electrical sensors using field effect transistor and resistance operate based on particular principles, they are limited by the gases and concentrations to which they can be applied. In fact, a single sensor able to detect hydrogen in a 5-digit concentration range has yet to be developed. Textbook physics states that acoustic waves, electromagnetic waves, and other such beams weaken as they spread through propagation. This phenomenon, which is known as diffraction, poses a limit for devices and elements that use waves. A wave that can be transmitted limitlessly in a single straight line has not yet been realized. However, in research on nondestructive evaluation of bearing balls, Dr. Yamanaka, the prizewinner, discovered a phenomenon that defies what is common knowledge in physics: a surface acoustic wave (SAW) that propagates along the great circle of the ball's surface (Fig. 1). If a SAW on the ball's surface is excited at an aperture-width approximately equal to the geometric mean (square root of the product) of the ball's diameter and wavelength, a parallel (collimated) beam will form that will not spread out no matter how far it is propagated. Because it will not be weakened by diffraction or subjected to scattering from the supports, over 100 turns (ultramultiple roundtrips) will be completed and propagation distance will rapidly increase as compared to the plane surface. Consequently, if the SAW is excited by means of an interdigital transducer or the like, changes in the speed of sound and attenuation will expand owing to the absorption and adsorption of gas molecules on the sensitive film of the propagation route, improving sensitivity. As a result of collaboration with a company to develop a ball SAW hydrogen gas sensor based on the aforementioned principles, success was achieved for the first time in detecting hydrogen in a 5-digit concentration range, 0.001% to 100%, with a single sensor. Field tests are now underway to verify it as the only highly sensitive hydrogen gas sensor that can be safely used even at hydrogen stations using high-pressure hydrogen. In addition, evaluation equipment using a ball SAW sensor with circuits adopted from acoustic microscope is being sold to universities and companies as a general gas-sensor development tool, and contributions continue to be made to innovations for sensor technology as a whole. As elastic waves interact with matter, which has varying degrees of freedom, their versatility is akin to that of something like herbal medicine, and they lack restrictions in terms of type of gas or range of concentration. Because the ball SAW sensor combines this feature with the high sensitivity resulting from ultramultiple roundtrips, it is expected to have manifold applications. For the purpose of security or environmental measurement, for example, projects are underway to apply it to gas chromatography, in which gas is separated using differences in retention time at the stationary phase, and to develop a portable gas sensor that can detect a variety of gases with high sensitivity. 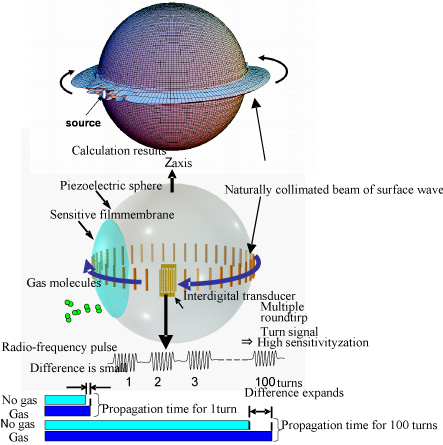 Collimated beams from the ball's surface waves are caused by the wave's original balance between diffraction and the focusing behavior of waves localized on the sphere's surface. This is so universal that it is surprising that it was not discovered until now. Because this phenomenon could exist, theoretically, not just with elastic waves but with electromagnetic waves (including light), as well, it has major potential for additional expansion to wave-motion-using sensors, signal processing and control elements.